There are no additional FEES to be added to our price! This saves you up to $1500 over what other dealers charge in extra fees including Documentary, Notary, Prep, and Environmental. We are one of the only stores in the USA with no fees, that is why we sell all over the country - saving our customer's thousands! Many customers don't realize how much in extra fees they pay when buying a car. We are your Lease Headquarters. We offer Free Lease Quotes from our Lease Experts saving you on your monthly payment by comparing which leasing company offers the lowest payment. Please email us your city and state and how many miles per year you drive (8000 10000 12000 15000). We will email you back a $0 down, 36 month quote. Email or call us today! 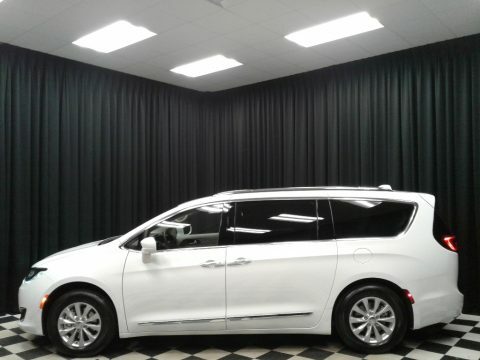 This is a new 2019 Chrysler Pacifica Touring-L with the 9 Speed Automatic Transmission and the 3.6L V6 Engine. It has Remote Keyless Entry with Keyless-n-Go, Remote Start, Full Speed Forward Collision Warning Plus, Adaptive Crusie Control w/ Stop and; Go, Lane Departure Warning Plus, Parallel and; Perpendicular Park Assist, Rain Sensitive Wind Shield Wipers, Power Windows, Power Locks, AC w/ 3 Zone Automatic Temperature Control, Power Sliding Doors and; Liftgate, ParkView Back up Camera w/ 360 Degree Suround View Camera System, ParkSense Front and Rear Park Assist w/Stop, Leather interior with Heated Front Power Seats, UConnect 4 AM/FM/SXM 7" Touchscreen Radio with 1 Year Complimentary Sirius XM Radio, UConnect Voice Command w/Bluetooth, Heated Leather Wrapped Steering Wheel w/ Mounted Audio Controls, Premium Fog Lamps, 2nd and; 3rd Row Stow-n-Go Seating with Drivers Seat Stow-n-Assist, 2nd and; 3rd Row Windows Shades, Roof Mounted Rear Entertainment System, 2 Pair Wireless Headphones, Remote Control, 115-Volt Auxiliary Power Outlet. The MSRP is $40,925. Internet and E-Bay pricing include rebates/incentives.